This is too good not to share - William Shatner in a 1977 model rocketry short film for Estes. Like my Facebook page for blog updates, extra features, and more pictures. As I reported on the NAR Facebook page last Sunday, I regret to have to inform you that a fatal on-field rocketry accident occurred in California last Saturday. I want to bring you up to speed on the status of our investigation. When I made the first announcement, there were few details available. We have since been working to understand what happened, so that we may all learn from it and prevent it from happening again. Our Association has no standing in the matter except as concerned and experienced enthusiasts, but I've been in contact with law enforcement and witnesses and have a preliminary set of facts to share. First, to the best of our knowledge, no NAR or TRA members were involved in this incident, certainly not directly involved. No kids were involved, except, unfortunately, as witnesses. 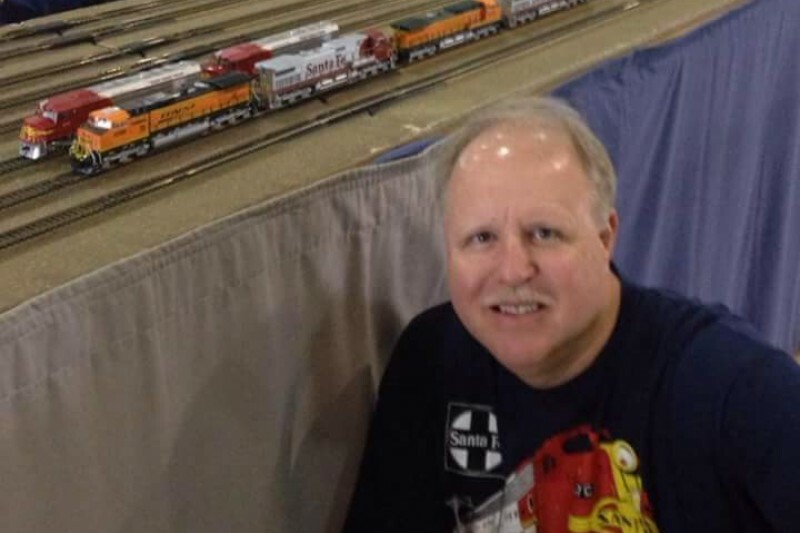 The deceased, Mike Bentley, a very experienced adult Scout leader, was at an annual BSA Council-sponsored rocketry and camping event for multiple scout troops called Rocket Rave, which has been conducted for at least several years. During the weekend, scouts complete tasks required for their Space Exploration merit badge, which requires two model rocket launches. During the launches, it has also been common for adults to launch their own, larger rockets. Around noon on Saturday, Mike engaged in a drag race with a second adult. Winds were likely within limits, safe distances were at least close to being met, and both rockets probably met the weight and power limits defined by the NAR Model Rocket Safety Code. The drag race was conducted from a dedicated area, to one side of the primary launch pads for the scouts to use to fly their conventional A through C powered model rockets, and about two dozen people were in the immediate vicinity. Mike's rocket was powered by a small APCP motor; the other rocket was powered by at least one, and possibly more, black powder motors. Both rockets launched; while Mike was watching his rocket, the other rocket arced over and came down ballistically, striking him in the face and causing severe injuries. Despite the best efforts of scouts, law enforcement, and medical professionals both at the scene and afterwards, his injuries were ultimately fatal. We know that the rocket that struck Mike was about four feet long and four inches in diameter. It had a cardboard body tube and a plastic nose cone. We don't know much else for sure. It is possible that the rocket was designed to fly on a cluster of motors, but at least one picture of the flight does not clearly show more than one motor firing. No parachute was deployed; none was seen at the accident site. At least one report indicates the rocket was damaged prior to flight. We don't know what motor(s) were used and whether they all ignited and functioned as designed. We don't know if applicable local laws were fully observed. I do know that the investigating law enforcement authority is not pursuing a criminal investigation at this time. The lack of an investigation will likely leave questions unanswered for some time. We don't know if the rocket would have been allowed to fly at a NAR launch; we can't definitively say whether the NAR safety code was observed or not. We will continue to gather information to the best of our ability, and we'll pass on significant new findings to you. Where does this leave us? We know that rocketry remains orders of magnitude more safe than any other outdoor activity we can name, provided the safety codes are followed. But it is not without risks; the safety code is our primary means of mitigating those risks. Everything in the safety codes is there for a reason, and I urge you to continue to observe-and when prudent, exceed-their recommendations every time you fly. Do preflight inspections of every rocket. Be especially careful with complex rockets. Pay special attention to the recovery system. Tilt your launch guides away from the crowds: Plan to have good flights, but also plan for bad flights to end in safe places. Add to the safe distance standards when lots of observers are present. Make sure launch controllers and ignition methods are appropriate for the motor(s) being used. Have a spotter for every rocket in a drag race, near enough to the RSO to be able to get a warning out if necessary. Have people point at malfunctioning rockets if they see them. Make sure the crowd can hear the RSO. Confirm the stability of untested designs. If rockets are flying over spectators, stop and fix the problem. Offer to help people and groups who are just starting down the path that we have trod. Set a safe, positive, and helpful example. Please consider contributing to Mike's memorial fund through his gofundme site. I'll continue to keep you informed, so that we can learn what we can from this unfortunate accident, and be safer because of it. I'm glad to hear that the NAR is actively investigating this incident, because we all want to know what happened, and all seek to prevent an accident like this from happening again. But I think it's important to remember that rocketry has had an unparalleled safety record for nearly sixty years. Follow the safety rules. Use common sense. Learn all you can about rockets before you try to build bigger and go higher. But fly without fear. Just recorded a special edition of The Rocketry Show about the incident in California. We don't have any more information than you folks, but some people did ask us to address it. In the mean time, you can still give to the family of Michael Bentley. 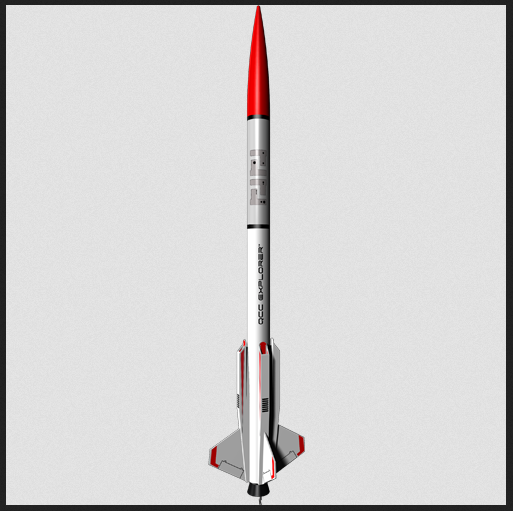 Model rocketry has been around for about 58 years, commercially. It has had an amazing safety record. In all that time, due to the materials from which model rockets are made, and due to the NAR Model Rocket Safety Code, injuries from rocketry have been minimal. When I was a kid, I visited my friend Scott. He had two kid-sized snow mobiles. We spent the day riding around on the huge patch of snowy ground next to his house. It was awesome! Of course, snowmobiles are dangerous, and I could have been killed. Accidents and deaths are not uncommon in snowmobiling. In the last 58 years, there has never been a recorded death due to any accident involving a model rocket. Scout leader Michael Bentley, of California, was struck in the face by a model rocket. He lost sight of the rocket as it flew up, and when it came down, he was hit in the face. He was rushed to the hospital. But, despite surgery, he succumbed to his injuries, and passed away. I have no doubt that he was operating safely, and that the rocket he built was made correctly. Speculation online has been... Well, one should not speculate based on one news report. Reports are sketchy, but I want to stress that this was a freak accident. What other recreational activity can you name that has been carried on for nearly sixty years without a single freak accident leading to a death? Knitting? Your grandma probably knits. But there are two freak accidental knitting deaths per year. Model rocketry has had a record of 58 years with nobody dying on the field (some have said there have been a few deaths, from rocketeers trying to retrieve a rocket from power lines). Rocketry is very safe. But sometimes, in life, accidents to happen. Even a paper rocket, with a plastic nose cone, which shouldn't do more than sting if it comes down hard, might do some real damage, once in 58 years. This is freaking out the rocketry community a little bit. But this is a once in over half a century event. Still, Mike Bentley was a standup scout leader, trying to teach some kids some cool stuff. Please consider donating to his family's GoFundMe. It will help defray funeral costs and medical bills accrued. For more on safety, please see the NAR Model Rocket Safety Code. If you are a total n00b to rocketry, wondering What's a good model rocket for an absolute beginner? then welcome, and this post is for you. First of all, I want to stress that these are just some things to consider. I'm not going to tell you "Don't pick this rocket, pick that rocket." I want to give you some pros, cons, etc. And I don't want to assume that you're "handy," that you've ever made anything with your hands before, or that you know how to use tools - only that you're interested in rocketry - because that was my situation when I started this whole thing. What I want to give you is some good information, and help you step by step as I build this blog further. I've been writing this blog for more than a year now, and if you go back to some of my older posts, you'll see I use a lot of photographs and really try to spell things out, so if you're an absolute beginner, you won't be scratching your head. If you have gone out and bought a launch set, such as the one I really like for beginners, the Estes Tandem-X, which provides all the ground support equipment you'll need to get started - a launch pad and launch controller - plus two rockets, at a really reasonable price - then perhaps the decision is made for you. 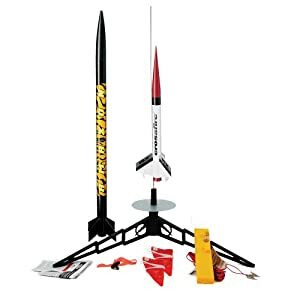 This set has the easy-to-assemble (or "E2X) Amazon rocket, which lifts off nice and slowly and doesn't go too high to see, plus the Skill Level 1 Crossfire ISX rocket, a nice high-performer which flies fast and high. But maybe you have a launch set, and simply want to start with something else. Maybe you aren't worried about launch equipment - maybe a friend has invited you to launch some rockets, and you just need something to bring. Maybe you just need a rocket. 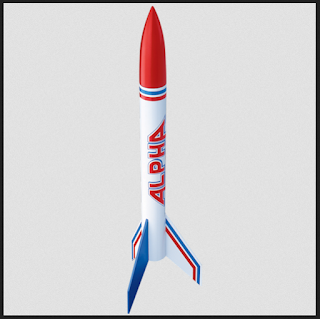 There are a lot of companies, large and small, which make model rockets for all skill levels. A lot of these are great, and you have time to explore all of them. The two biggest companies for model rocketry are Estes and Quest Aerospace (or simply "Quest"). For the purposes of this blog post, I'm going to focus on Estes kits, for a couple of reasons. First of all, Estes is the most prominent (and oldest) model rocket company in existence. Second, a lot of the kits are really basic. I love Quest rockets, but I can tell you from teaching a rocketry camp that some of their Skill Level 1 rockets are actually a little complicated for the absolute beginner. Rocketry is not merely a children's hobby, but having seen some children struggle a bit with a few of the parts on a basic Quest rocket, I'd say that for a beginner with no construction experience, it might be tricky, if you're unsure of your skills. Building a rocket is not hard, but it's best to start simple. Model rockets are just the beginning - if you're new to the hobby, you'd be surprised at how large, complicated and high-performing a hobby rocket can get. A lot of adults are into high power rocketry, and building a model rocket is the first step. That said, Apogee Components also has some great basic beginner's kits. So does Semroc. And FlisKits. And there are plenty of others. It's best to shop around. There are three things to consider when deciding on what rocket to start with. While I don't want to dissuade you from checking out all the fine model rocket companies out there, for the purposes of this post, I'll stick with Estes rockets. For most Estes Skill Level 1 rockets (and we'll get to what "Skill Level 1" means below), smaller tends to be cheaper. Perhaps you want to test the waters with something less expensive before going for the big, complicated, pricey rockets out there. Here are a couple of great little rockets I built, for very little money. The Hi Flier is less than 12 inches tall, and the Star Trooper is just over 6. The Hi Flier is less than 3/4 inch in diameter, and the Star Trooper is just over 1/2 inch in diameter. The Hi Flier cost little more than $8.00. The Star Trooper was just over six bucks! I won't say too much about price here. You can shop around on the Estes website, or look up "model rockets" on Amazon.com (you'll find a lot of Estes rockets and some others as well) and compare prices. If you're looking for cheap rockets to start with, small and simple are the cheapest. I've built a few pretty large model rockets. When I've shown them to people (who were not rocketeers), they've all said the same thing - "I bet that one goes really high!" Well... Sometimes. It's true - if you want to achieve and altitude of thousands of feet, you'll need a larger rocket, because you'll need to accommodate a larger rocket motor. But unlike a space rocket, a model rocket is not an empty cylinder full of fuel. It has a disposable (or sometimes re-loadable) motor inside, of a standard diameter and length. 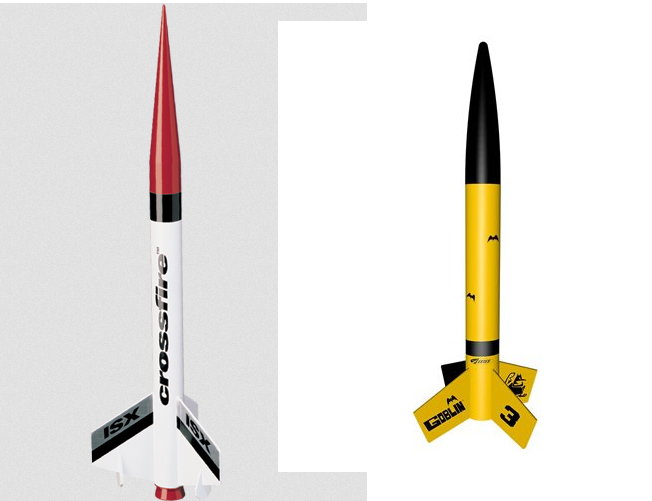 For two rockets which take a motor of the same size, the thinner, smaller model often outperforms the larger one. Look up at the Hi Flier again - a skinny little rocket. Now look at this rocket - a classic Estes kit called the Big Bertha. The Big Bertha stands 24 inches tall - twice the height of the Hi Flier. And it's 1.64 inches in diameter - more than twice as large than the Hi Flier. It also weighs much more and has larger fins. Due to its size, the Big Bertha has more aerodynamic drag - or wind resistance - than the Hi Flier. Both rockets can fly on the same motor, but while the Hi Flier can reach an altitude of nearly 1700 feet, the Big Bertha is restricted to about 500 feet of maximum altitude. The Sky Trooper, also pictured above, flies on much smaller motors than either the Hi Flier or the Big Bertha, but due to its size and low weight, it can go higher than 900 feet. 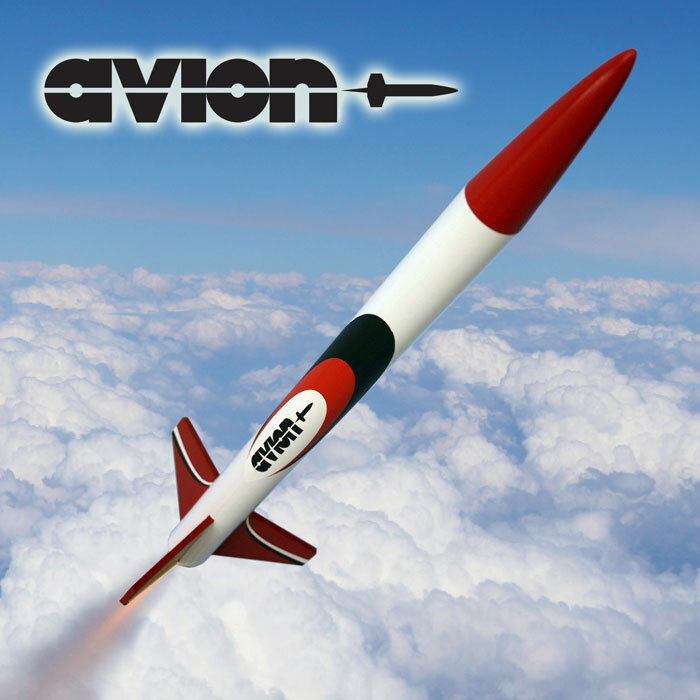 So, do you want a high-flying, high-performing rocket for your first one? Well, if it's cheap, and you're adventurous, perhaps you do! But you need to think about that for a moment. I still have my Big Bertha. My Hi Flier and Star Trooper both flew so high on every flight, I couldn't see them any more. And while I still have my Big Bertha, I have lost both the Hi Flier and Star Trooper. The Tandem-X launch kit I mentioned above had two rockets I launched on my first time out to the flying field. Both belonged to my friend Chad. We launched the Crossfire ISX to an altitude of perhaps 1200 feet, and the Amazon to maybe 500 or 600. The Crossfire was lost on the first time out. I still have Chad's Amazon. If you have a large field to launch from, a high performing rocket might be for you. But if you're more cautious about your first rocket, consider choosing a rocket which goes to less extreme altitudes. Most companies, including Estes, will give expected performance of each rocket, and you can choose from there. So far, we've seen that smaller rocket kits tend to be cheaper, and can often go much higher. This can be quite thrilling. That does make them easier to lose, but it's also less costly if you do lose one. For the beginning rocket builder, this might be the most important consideration, especially if, like me, you are not used to putting things together with your hands when you first start out. Most rockets are pretty simple things - basically a hollow tube with some extra parts stuck on - but some rockets are simpler to build than others. If you are nervous about building your first rocket, there are some good options for you. Estes, and other companies, have pre-made rockets to get you started. In Estes lingo, these are ready-to-fly (RTF), almost-ready-to-fly (ARF), and easy-to-assemble (E2X). The RTF and ARF models are basically built, and require very little prep before launching. They can be ready in minutes. The Estes Patriarch. Tall, fat, flies beautifully, and already built for you. E2X models are good if you are unsure about your skills with glue, paint, sanding, cutting, getting fins on straight, or any kind of model construction. They fly quite well, can be assembled quickly, and are a good stepping-stone. 15-20 minutes. Once the glue is dry, it's ready to fly. But, before long, you'll probably want to build something yourself. It isn't hard. Most rocket companies, Estes included, attribute different skill levels to their rockets. The levels range from 1 to 4 or 5. What you'll start looking for is a Skill Level 1 rocket. But what does that mean? It's a tricky question. Tim Van Milligan of Apogee Components wrote an article on this subject in the company's newsletter. It's an interesting read, but what I take away from it is that "skill level" is an ill-defined, arbitrary rating system that varies from company to company, and even from rocket to rocket. Once you get to higher skill level rockets, building does get more challenging. A beautiful Estes called the QCC Explorer is a Skill Level 4 rocket. This rocket has a lot of small parts, and as you can see from this series by Chris Michielssen of the Model Rocket Building blog, it is certainly challenging. But between skill levels 1 and 2, it's a bit fuzzier. There are some Skill Level 1 rockets from Estes which I'd consider more complicated, and some really simple Skill Level 2 rockets. To demonstrate what I mean, let's take a quick look at two rockets - the Skill Level 1 Crossfire ISX, and the Skill Level 2 Goblin. Both of these images are from the Estes website. Their relative sizes are not to scale in this picture. The Crossfire, which comes with the Tandem-X launch set, is a Skill Level 1 rocket. But it's a little more complicated than some, for an absolute beginner. If you look at the parts in red, you'll see the nose cone at the top, and a decorative nozzle at the bottom. In the kit, these come attached, as one plastic part. You have to cut these apart, then cut the ends off the nozzle bit. If, as the directions state, you used a hobby knife, it would take a long time. If you grew impatient, you'd be tempted to press too hard, and potentially break the hobby knife blade, damage the part, or cut yourself. I used a borrowed hack saw to cut mine apart. This meant I had some extra sanding to do. Then you must cut a little tab out of the nozzle to clear the way for the motor hook - a small, metal hook which keeps the rocket motor from falling out. You glue the nozzle into the rocket using plastic cement. Then, there are the fins. They have some tiny little parts, which the kit calls "stabilizers," which glue into slots on the aft end of the fins. And rather than simply being glued onto the outside of the rocket, as with many model rockets, these fins have little tabs on their root edges. The tabs go into slots on the body tube. This is called through-the-wall fin construction. It adds strength to the model, and ensures you get the fins on straight, but it does make the build a little more complicated for an absolute beginner. So, you've got multi-part, through-the-wall fins, plastic parts which must be carefully cut apart, and you need a special adhesive (plastic cement), in addition to the normal white glue or wood glue you would use to build any model rocket. Yet, the Crossfire is considered a Skill Level 1 rocket. Whereas, building the Goblin couldn't be simpler. It's a basic rocket which you can assemble entirely with one kind of glue (white or wood glue), no extra tiny parts, and no plastic parts to cut. Why is the Goblin a Skill Level 2 rocket? Well, I'm not sure, but perhaps it is because the Goblin uses larger, D-class rocket motors. Depending on where you live, you may need to be of a certain age to purchase these larger motors. So, if you're a kid, you should be able to build a Goblin with no more trouble than any simple Skill Level 1 rocket - but you may need an adult to actually fly it. That being said, I'm sure you can build any rocket you choose to, so long as you can follow instructions. If you're curious what the construction of any particular rocket will be like, you can usually find the instructions online before you buy the rocket. The instructions for most Estes kits can be found on the Estes website, on this page. Just look up any rocket you're interested in building to see if there are any complicated parts, special instructions, or special materials needed. A very common first rocket is the Estes Alpha. Just over 12 inches tall and not quite an inch in diameter, the rocket costs about $15, which is affordable, and it's pretty simple. It's what's commonly called a "Three-Fins-And-A-Nosecone," or 3FNC rocket, meaning it's got all the basic parts, but isn't too distinctive. Many rocket camps choose this rocket to build, because it's basic and affordable, not too big or too small, and they can be purchased in 12-rocket bulk packs for about $108, making them less than ten dollars per kit. For smaller fields, you can keep the altitude down to about 300 feet on an A motor, but with a C motor, you can top 1,000 feet! It's a classic kit, and not a bad choice for a first rocket builder kit. I find larger parts easier to work with. Smaller rockets, like the tiny Star Trooper, are much cheaper, and fly really high, but the parts are really tiny. That's not to say that you can't do it! But I have less trouble working with large parts - whether it's gluing them in place, putting tape on them to mask them for painting, sanding fins to a shape I want, or adding decals. My first rocket was the Estes Der Red Max, and it was about perfect for a first rocket. It flies on standard A-C motors, wasn't too expensive, has a simple paint job, and has large parts. It's a BT60-based rocket. BT60 refers to the diameter of the paper body tube of the rocket. A BT60 tube is 1.637 inch in diameter - nice and large. Here's a picture of the Der Red Max in my hand so you get an idea of its size. This is so close to the camera that the fins are slightly distorted - they're not as enormous as they appear here. Still, you can see that the parts on this rocket are nice and large - and, I find, easier to handle. It also flies really well, and is a thrill to watch. The Big Bertha is another BT60-based rocket. It stands over two feet tall, lifts off slowly, and has nice, large fins. Again, an easy build. Kits don't generally tell you what BT-size they're based on, but they do give general dimensions, including diameter. BT60 is 1.637 inch in diameter, BT55 is 1.325 inch (see the Goblin, above), and BT50 is 0.976 (see the Alpha, above). These are all decent sizes. If you look at the picture, you can compare the relative sizes of the parts to the airframe, and that will give you a general idea of what you're working with. The Estes Mini Honest John is BT50-based. It's 0.976 inch in diameter, like the Alpha. But the fins, and especially the decals, are very tiny. This was a more challenging build. That said, it was only my third rocket, and it came out nicely. Small parts doesn't necessarily mean difficult, but large parts are a little easier to work with. They do get bigger as well. There's BT70 at 2.217 inches and BT80 at 2.6 inches in diameter. For a beginner, these are really large. First time I saw a kit in person with a BT80 tube, it was the Estes Big Daddy. I thought, that thing is freaking huge! It wasn't tall, but I'd never seen a rocket larger in diameter in person at that point. But maybe you are handy, used to making things yourself, and if you're ambitious, there's no reason not to start there if you want to. But there's no reason not to start smaller. There area a lot of cool rockets out there, and some of them are quite small. To start, just pick a rocket you like; follow the instructions. Rocketry is challenging, but not hard. You can do this. Like my Facebook page for blog updates, pictures, and extra stuff.